At Ark Industries, we pride ourselves in delivering one of the best printing services in Singapore. We are constantly researching new methods to innovate ourselves. Sublimation printing is a fairly new technique that uses heat sensitive inks that turn into gas under the influence of heat and infuse directly into a 100% polyester fabric. Sublimation printing is a permanent infusion process where the heat sensitive ink will form part of the fabric. 2. Cost does not increase with the number of colours in your design. Sublimation printing is mostly used for customised jerseys, polo tees, T-shirts and lanyards which require multi-coloured designs or even photos. The best effect would be achieved on white or light colour polyester fabric. 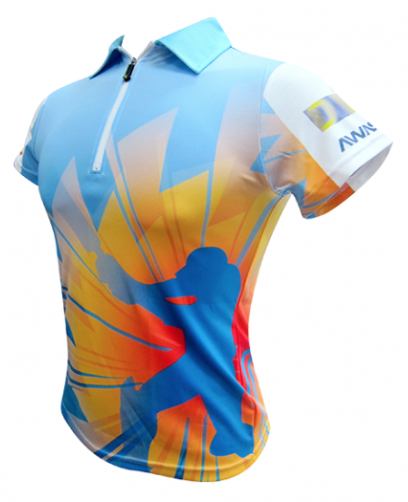 Design and customise tees, polo tees or sports apparel such as for cycling and bowling. Most recommended for vibrant and colourful, all-over print. Customise your lanyard with full colour prints and logos!